The daily prompt reminds me of some of the legendary love stories, where the family of one of the lovers cannot understand,how he could fall in love with someone so unattractive. They were reminded the famous proverb, “Beauty lies in the Eye of the Beholder”. Shakespeare in ‘Love’s Labour’s Lost’ penned the line ‘Beauty is bought by judgement of the eye’. I love music. I will describe in my own way,how I feel when I hear a beautiful piece of music. The following is a song by Celine Dion,when I first heard it I wanted to know who she was. I simply love this song. I consider blogging an “Art”. I have ways to go to achieve this special ‘Art’. In my opinion I am doing well. Anytime I am able to write the daily prompts successfully according to my estimation, my attempts are worth considering. Then if I even have one follower who likes what I write,it is victory for me. Since I’ve joined the daily prompt group,I am exposed to a variety of topics,I have written as much as was possible. Some were easier than others. The main thing is I’ve taken the prompts and made them my own. Opinions differ about the”Secret of Success”, I feel if I can nail the topic my way, that’s the secret of my success. Granted when my work is published, you wouldn’t find it crowded with comments,I’ll probably have one or at the most two. It really does not matter and it will not stop me to continue writing. The pleasure I derive from writing a paragraph or two each morning is enough for me to tell myself ,”I AM SUCCESSFUL’! When an artists paints or sculpts or does etching,he imagines how his work should turn out,to please or wow the lover’s of art. When I look at art these things come to mind. I happen to have a few paintings and etching that my husband and I bought. They are beautiful.We are fortunate enough to have them.There is a painting of a Japanese artist.I absolutely adore . The main subject is the peacock. The colors are so realistic,it makes one think it is a photograph. The peacock is on the grass,its tail is spread out.There is the blue sky, the pink flower trees,the white pea hens,the flying black birds.The main attraction in this painting is the peacock with its beautiful tail. When you look at it the first time,the peacock’s feathers dazzles the eye,then you look for other things and you can notice that the pea hens are almost invisible. The red,white and the pink flowers add the beauty of this particular painting. This painting tells me the painter spent a lot of time,before he started. His work proves it. This is why you keep me awake. This is why you startle me by your call. O distressed one,I will sing for you. the bird is back in its nest. only my heart cannot rest. you did not let my weeping stop. I know you watch my pain secretly. 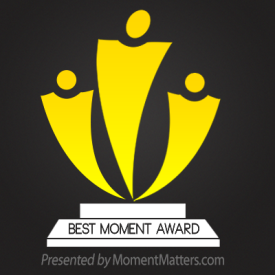 This post is specially for Akhtar Bhai, Khurram Bhai,Robert, Shaidi and all the others who continuously encourage me. Thank you. I started blogging,after I read a post of my course participant.It was his first post. I wondered about blogging myself. I asked the course facilitator,he encouraged me. I prepared to write a post. In the beginning I wrote about anything that came to mind. Then I wrote a story,another course participant advised me to expand the story. I did that,I soon felt I had extended it long enough,I should give it an ending. The same person once again encouraged me to write about some cities in my homeland. Next came the suggestion to translate Tagore’s poems. I thought it was a great idea,when I started I realized I liked Tagore’s poems and his songs,the idea of translating them into English,was in my mind not a piece of cake. I had some rocky roads to climb at first,I thought how dare did I even attempt to do such an arduous task. I continued to translate and felt at some point I must quit. I didn’t do it yet. The comments from the same person keeps me going.Every now and then I write something different. But I go back to Tagore’s work. To some extent my blog is a place where I try to express myself and see how creative I can be. I don’t think I’ve been able to attract many readers to read my blogs.I only have a few loyal course participants,who regularly read my blog. I’ve tried visiting other blogs and also left my comments,but I don’t find them showing any interest to read mine.If they read it,I don’t have any evidence,because there are no comments left by them. I still am on the look out to know what topics would encourage other bloggers to read my post. At this moment I have my very faithful friends who make an effort to visit my blog and leave a comment. I couldn’t have asked for more. 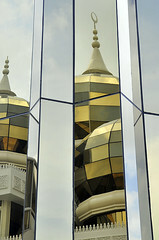 Made of Steel,Glass and Crystal.It is one of the most beautiful mosques in the world. The construction started in 2006 and was completed in 2008. 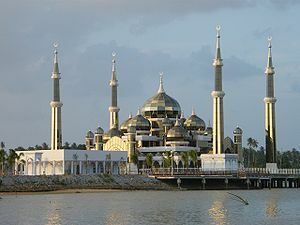 It is located at Islamic Heritage on the island of Wan Man in Malaysia. It has the capacity to accommodate 1500 worshippers at a time. There are four minarets in the mosque.